Are you looking for the right way to clean your hot tub? Do you find yourself feeling dissatisfied with your current filter? Are you a new hot tub owner feeling a little lost and confused when it comes to keeping your water clean? Whatever the reason, if you are looking for information about a hot tub filter system, you’ve come to the right place. The fact of the matter remains--if you have a hot tub, there will come a time when you need to buy a hot tub water filter! Q&A: What Is A Hot Tub Filter? Q&A: Do I Really Need a Filter For My Hot Tub? Q&A: How Can A Spa Filter Help My Hot Tub, Exactly? Hot Tub Filters: What Are The Different Spa Filter Types? How Do They Work? Q&A: How To Install Your Tub Filter Product? Q&A: How To Clean Your Hot Tub Filter? Q&A: When To Replace My Hot Tub Filter? Q&A: How To Change My Hot Tub Filter? TROUBLESHOOTING: What Happens When My Filter Isn’t Working? Hot tub filters are an important part of any spa system. They help regulate the quality of the water that enters your spa, and they can keep debris, dirt, and other items from floating into the pipes and causing damage to the pump and inner workings of your hot tub. They might even be the most valuable part of your whole hot tub, so it pays to replace them regularly. You might feel a little overwhelmed choosing the right hottub filters for your specific model, but don’t worry. It doesn’t have to be a complicated challenge to shop for filters for hot tubs. If you need more information to help you get started, you’ve come to the right place. In this article, you’ll learn everything you need to know about 17 of the best hot tub filters available on the market today. You’ll be able to choose the right filter for your specific model, and you’ll be able to compare hot tub filters by size, function, and power as well. You’ll find filters that work for just about every hot tub imaginable, including older models that might still be serving you well. You’ll even find some ceramic filters on this list if you feel like making an upgrade. By the time you’ve finished reading, you’ll know everything you need to choose the right filters for hot tub use in your home. You’ll never have to wonder again about whether or not you’re buying the right product. Now it’s time to get started learning! When it comes to hot tubs filters are one of the most important parts of the whole system. These reviews are here to help you choose the right type of filter for the kind of hot tub you have based on size, frequency of use, and more. Remember, when choosing your filter, it’s always a good idea to head outside and measure your existing filter first before you go shopping. That way, you can easily compare the dimensions of every filter you look at with the one in your hot tub to make it easier than ever to narrow down your options. Of course, if you have a hot tub that doesn’t have a filter installed already, you can look up the same information in your owner’s manual. 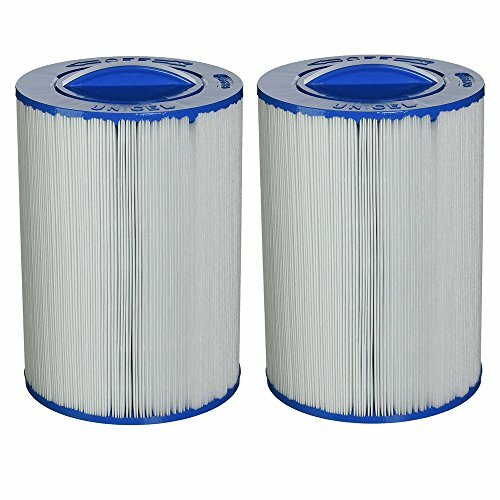 Choose the Unicel 4CH-940-2 Replacement Filter Cartridge when you are looking to purchase a brand name product that you know is backed by a lot of customer satisfaction. 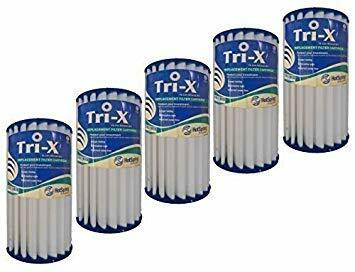 This filter is available either as a single replacement, a two pack, a four pack, or a very affordable six pack that can help you save a lot of money. It features plenty of pleats to make it easier than ever to catch debris and bacteria without it ever reaching the water in your hot tub. High-quality product that is backed by a well-known hot tub filters brand name. Higher pleat count is better at keeping your water crystal clear for much longer than other hot tub filters. Durable plastic and polyester hot tub filters construction can stand up to a lot of use. Unicel hot tub filters are more expensive than other replacement filters on the market. These hot tub filters may not work well with very hard water. These hot tub filters may show signs of staining over time if your hot tub is very grimy. Are you searching for a great microfilter replacement for Waterway and similar hot tub brands? 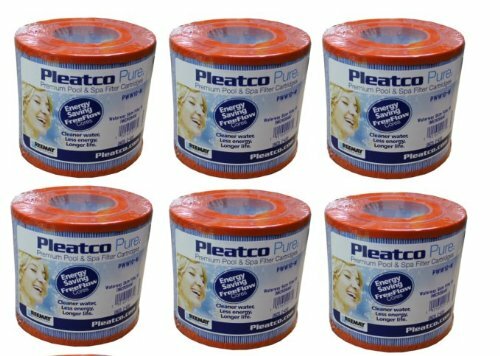 If so, try this popular Pleatco filter right away. This filter can be used with a variety of different hot tubs, and it’s designed for use with pop-up spas specifically. It can provide you with an affordable alternative to many other microfilters on the market today. Designed for use in conjunction with other traditional hot tub filters, but also works well on its own in certain types of hot tubs. ​Features a large surface area that allows water to pass through quickly and easily for the best possible filtration. ​Durable, reinforced media threading and plastic casing keep this filter from becoming easily damaged even with frequent use. Smaller hot tub filters like this one may be difficult or even impossible to clean well, so it might need to be replaced more frequently. These filters are smaller and can’t do as much work as larger hot tub filters, so they can be a costly addition to your spa. Some hot tubs aren’t designed for use with micro hot tub filters and might not be compatible with this type of filter cartridge. When you need a little extra protection for your water, reach for the Guardian Pool Spa Filter and let it do the hard work for you. This filter features an antimicrobial filter media that is sure to trap just about any bacteria that might threaten to make its way into your spa. It can easily replace many Unicel, Pleatco, and Rainbow brand products, and it works in many hot tubs. 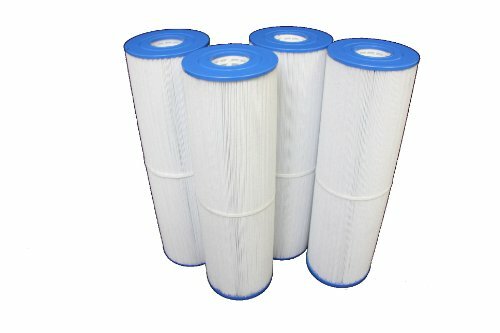 Very affordable alternative to other similar hot tub filters products, especially since it’s available in a three filter pack. ​Features a large filter area that allows as much water as possible to filtered quickly and efficiently. Easy to install and replace these hot tub filters when the time comes with a few quick motions. Pleating may be difficult to clean on these hot tub filters, as it can be hard to separate fine pleats by hand for regular rinsing. Fine pleats may also cause hidden pockets of debris and dirt that may not get washed, causing backwash into the spa. Paper filter media is not durable enough to hold up to repeated use and may need to be replaced much more frequently than other hot tub filters on this list. The 6473-165 Spa/Jacuzzi filter is an excellent and simple option for anyone looking to replace the filter in a hot tub, pool, or both. This is a larger filter that’s designed for use with specifically larger hot tubs. It can work in modern spas made by Optima, Sundance, Majesta, Capri, and much more. This filter is made by Pleatco, which is a leading brand in affordable replacement hot tub filters, so you know you’re getting a good quality item when you go with this one. Works well with many modern hot tubs from popular brands, making it a good near-universal filter option. ​Features a durable plastic casing that can hold up to a lot of wear and tear without showing signs of damage. ​Fitted with a hollow center that allows plenty of water to pass through easily. Does not include a built-in handle, so may be more difficult to install and replace than some other models on the market today. Filter media is not reinforced and may come loose with use over time. More expensive than some other hot tub filters in the same level of quality that you might find. Sometimes, a brand name you can trust goes a long way toward helping you choose the right filter for your spa. 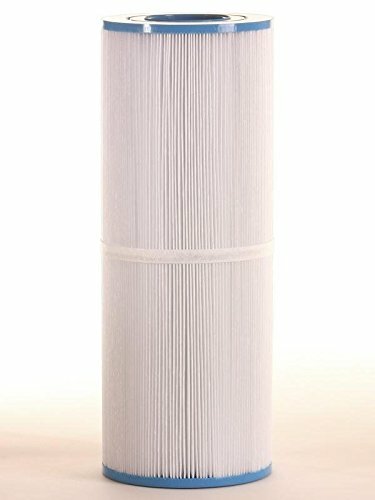 Go with the Unicel C-8465-2 Replacement Filter Cartridge when you want to rely on a tried and true spa filter brand. This very durable, large filter can be used with many different Unicel-compatible hot tubs. It is a very efficient and powerful filter that has proven time and again to be ablet o remove even the toughest substances from spa water. Made by a trusted brand name that is known for providing top-quality hot tub filters at a reasonable price. ​Designed for extended use up to a year with proper maintenance and cleaning at regular intervals. ​Able to hold up to frequent use and cleanings, even when soaked in strong chemical cleaning solutions. May leave a small gap and not create a strong seal between the filter cartridge and the housing unit. More expensive than other comparable hot tub filters on the market today. Must be purchased as a two-pack set from this listing, which further increases the price. Save a lot of money when you go with this 4 Pack Lot of Filter Cartridges. These cartridges can replace products made by Filbur, Rainbow, Unicel, and Pleatco, as well as many others. They work in several different types of hot tubs as well. These are longer hot tub filters than some of the others listed here, so if you have a very short filter housing unit, they might not be the right option for you. Despite their size, they are very light, and they can be installed and removed easily. Designed to quickly and simply pop in and out of place in your filter housing unit. ​Feature fine pleating to catch and trap bacteria and debris with ease. ​Interchangeable with many different, more expensive products on the market today. Must be purchased in a four pack, which might be too costly for some hot tub owners. Filter media is not reinforced and may pop loose with extended use. Plastic casings for the filter media are not reinforced and may degrade over time with exposure to chemical water treatments. Choose the No products found. when you want a very high-quality product that is sure to last a long time to come. This brand name Sundance filter is designed for use with all of the Sundance hot tub products made in the past few years, and may even work with older models from this company as well. This powerful filter is made to last for over a year if you pair it with regular cleanings and hot tub maintenance, so it’s a very affordable option in the long run. Cuts back on the amount of maintenance needed by reducing the use of extra filter pieces. ​Excellent, durable construction that can stand up to a lot of exposure and use over time. ​Designed to be used for well over a year when coupled with proper cleaning and maintenance. Only designed for use with Sundance brand hot tubs, and may not be able to be used with all of these. Cannot be used in conjunction with microfilters or other types of additional filtration. May be difficult to clean as the pleats in the filter media are harder to separate by hand. Pick up this Pool Filter 2-Pack for Swimming Pool and Spa use if you’re looking for a very low-cost alternative to some of the most popular brand name hot tub filters on the market today. 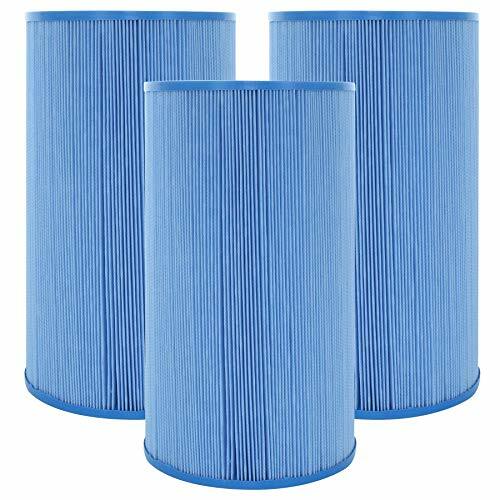 This filter is made by Aqua Kleen and can easily replace Pleatco, Filbur, and Unicel products, as well as some others. It features fine pleats to catch as many bacteria as possible and a reinforced plastic casing. Great option for anyone who doesn’t use the hot tub as often as others and would like an affordable filter that won’t go over budget. ​Available in a two-pack to make it even easier for you to save money in the long run with this filter. ​Great at trapping dirt and debris in the fine pleating of the filter media. Might be much lighter and flimsier than some of the other filter models available on this list. May not be able to be used with harsh water treatment chemicals or soaked in powerful cleaners. These hot tub filters do not last as long as others on the market and will need to be replaced more frequently. If you have a hot tub with a filter cartridge that’s difficult to find a replacement for, you might need to go with these 2 Replacement Filters for Lifesmart products. They can also work with hot tubs made by Simplicity, Bermuda Spas, and Hydromaster, among several others. 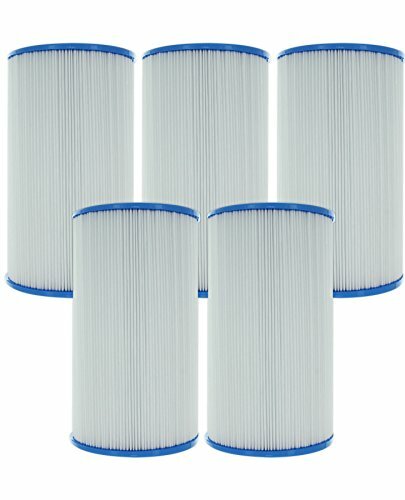 These are a unique size that might be harder to find among other filter cartridge replacements, and they’re very affordable too. Very easy to install and remove with just a few simple twists and no tools required. An affordable alternative to other hot tub filters, particularly since it is available in a two-pack set. ​Easy to use with a wide variety of different hot tubs across the board. Because the threading on this filter is on the outside, it adds about an inch diameter that might make the filter not fit into some hot tubs. This filter does not feature an additional reinforcement to keep the pleating from coming loose over time. Plastic casing may flake or chip over time and float into the water of your spa. Choose the PSD125U C-8325 FC-2790 Sundance Comparable Pool & Spa Filter when you want to replace hot tub filters in slightly older hot tub models. Although this filter touts its ability to work with Sundance spas, you can also use it in Montego, Capri, Altamar, and other older spa brands that were sold during the later part of the 1990s. If you have an older hot tub, do yourself a favor and check out these filters today. Excellent option if you have an older spa that can be difficult to find replacement hot tub filters for. ​Easy to clean by simply opening the pleats by hand and rinsing in between thorough soaks. ​Durable enough to use again and again with cleaning. Much more expensive than many other hot tub filters on the market today, including some that do still fit older models. Filter media may pull away from the plastic casing over time with exposure to harsh pool chemicals. Because of the fine pleats, stains and problem areas may be hidden without a close examination at cleaning time. Are you looking for an OEM spa filter replacement for your Sundanc﻿e brand hot tub? If so, look no further than this high-quality filter replacement. It’s made by the Sundance company and works well with many of the modern-day products made by this brand. 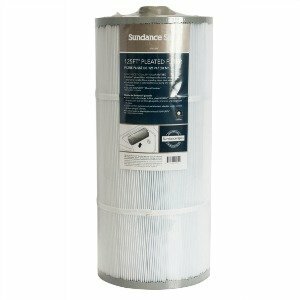 This filter, like all of the Sundance filter products, features a durable, reinforced threading on the cartridge media and a strong plastic casing that will never become damaged by the chemicals in your spa. This filter is made by a brand name manufacturer, which means it always is backed by a product and customer service guarantee. These are powerful hot tub filters that remove a lot of bacteria from the water and can be used with fewer harsh chemicals. ​Filter media isn’t prone to shredding. May become weakened by frequent cleanings and might not hold up as well as other hot tub filters. Because it is a brand name filter, it is more expensive than other models on this list. This filter cannot be used with any products other than Sundance brand hot tubs. If you find yourself searching for an affordable way to stock up on plenty of ceramic hot tub filters, try this pack of Hot Spring Spas Tri-X Spa Filters today. Ceramic filters are unique in that they work much like a pleated filter and look like one, too, but the media is made of ceramic instead of the usual polyester. This makes these products much more durable than their counterparts, but may also cause the price to go up significantly as well. Very easy to clean by simply rinsing with a garden hose or running through the dishwasher. With proper cleaning and hot tub maintenance, these hot tub filters can last for several years. ​Very resistant to rips, tears, and other damage from extended use. This is a much more expensive alternative to traditional hot tub filters and might be too costly to purchase all at once. Filters for this listing must be bought in a pack of five, which makes the cost even higher. These hot tub filters may not be best for use with very dirty or frequently-used hot tubs. If you prefer to try a ceramic filter for your hot tub without committing to a five-filter pack, you can purchase this individual HotSpring Tri-X Filter instead and see what a difference a ceramic filter can really make for your spa system. This high-quality filter is designed to hold up to repeated use and easy washing without the need for a lengthy, damaging soak. Although it is designed a bit differently than traditional cartridge hot tub filters, it works in more or less the same way and is interchangeable with many traditional filter products. Very easy to clean by rinsing with a garden hose or placing in the dishwasher with some detergent. ​Made to last for several years longer than traditional polyester and paper filters. ​The plastic casing is designed to stand up to a lot of use and won’t flake or chip. If these hot tub filters aren’t packaged well, they may arrive with cracks or other damage and will need to be replaced or repaired. May need to be rinsed more often than a traditional pleated filter to keep dirt from backwashing into the spa. Might be too expensive, especially for spas that require the use of two filters at a time to function properly. 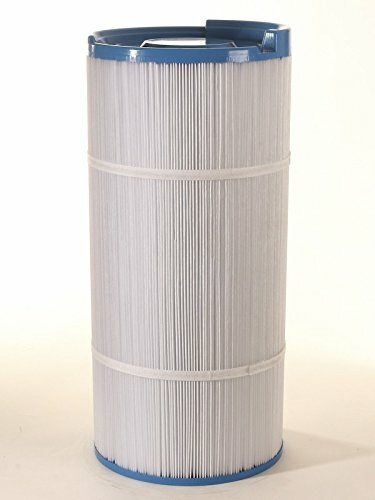 If you have a Watkins brand filter in place in your spa already, this OEM Filter Cartridge is a potential good replacement that can save you a lot of money. This filter is designed for larger spas that require bigger hot tub filters, so if you have a big hot tub you might be able to use this one. It features a reinforced plastic casing that will help keep the blue plastic pieces from breaking or chipping and floating into your spa water, which in turn keeps you safer and cleaner with extended uses. Designed to hold up to repeated use and plenty of cleanings and soaking before it needs to be replaced. ​Pleats are held in place well and aren’t prone to popping loose over time. ​Easy to clean by simply parting the pleats by hand and rinsing with a garden hose. May not be compatible with every type of hot tub, particularly if yours is a smaller or inflatable model. Thin filter media may tear or rip with repeated use and might need to be replaced more frequently than other hot tub filters. More expensive than other, similar hot tub filters available on the market. Choose this affordable five-pack of Guardian Pool Spa Filters if you have a pool, a hot tub, or both that ordinarily use filter cartridges made by the Unicel or Watkins companies. These filters are interchangeable with many of the products made by both Watkins and Unicel, and they work nicely in many different types of hot tubs. They feature reinforced threading for the filter media so you never have to worry about the pleating coming loose and becoming ineffective, even with frequent use and cleaning. Made to last and feature an added band to help keep the pleating in place even with extended use. ​Able to stand up to repeated soaking and cleaning for maximum life out of your filters. 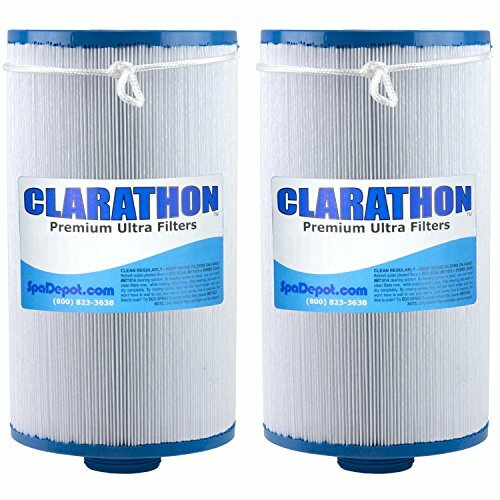 ​An affordable alternative to more expensive filters for popular hot tub brands. Does not come with all the parts needed to attach the filter cartridge in place of the old one. Does not provide the same level of sealing protection as other types of comparable filters. Media is made of thin paper material so it is prone to tearing more frequently than other types of filters. 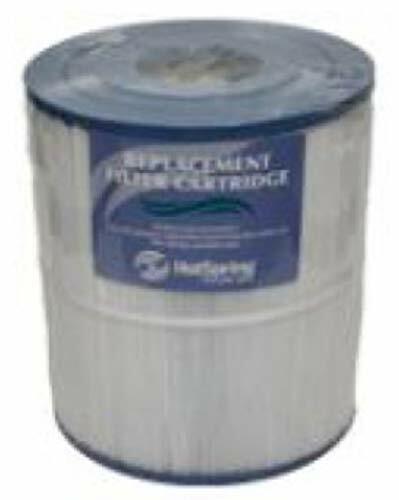 This durable hot tub filter replacement cartridge is yet another great solution if you’re looking for a ceramic replacement to a traditional filter. It’s made to last a long time, and it can be used for much longer than a traditional polyester style filter. 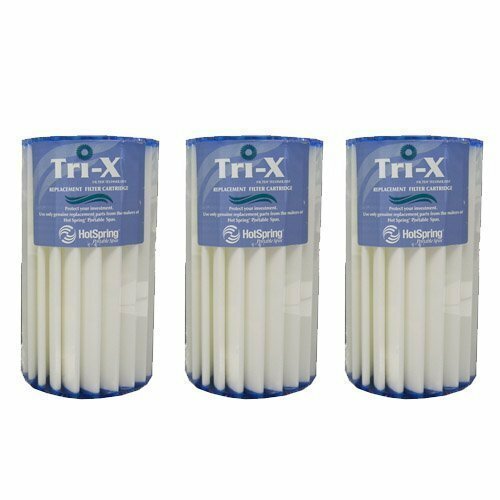 Best of all, with this particular listing, you can purchase a pack of three of these quality filters and stock up for future use. You will be well supplied for a long time to come! Much more affordable than well-known name brand replacement ceramic filters. ​Easy to clean by simply running through the dishwasher with a little bit of detergent. ​Great for hard to clean hot tubs and even for hard water issues. Difficult to adjust and may not be able to be used with some of the more popular hot tubs on the market today. May be more expensive than traditional polyester filters. May not be able to be used in conjunction with a separate microfilter or in filter, depending on your hot tub model. The Spa Frog In-Filter is designed for use in conjunction with a traditional style of filter. It is a separate product, but when you use it along with your usual filter, you will be able to cut back significantly on the amount of chlorine and bromine you need to use to treat your water and bring it to the right pH level. 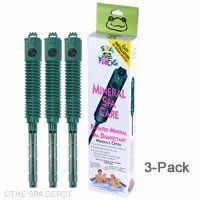 You will have much cleaner water for a much longer time when you add the Spa Frog In-Filter to your usual filtration system. Best of all, it’s easy to install and even easier to use and replace when the time comes. With this listing, you’ll have enough to last you for a year. Helps keep water feeling comfortable and not too harsh for frequent use. 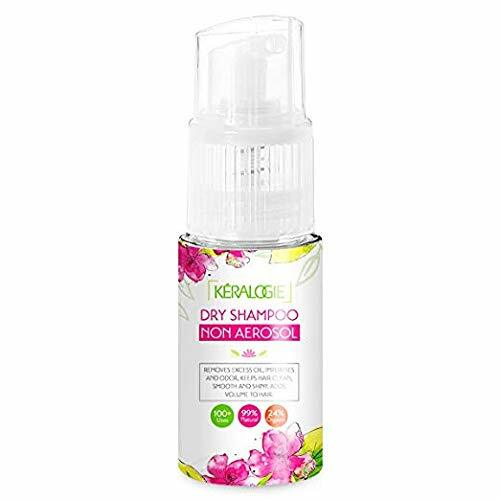 ​Makes it easier for you to balance the chemicals in your spa and cut back on the use of those chemicals too. ​This product helps the filter work much more efficiently and last a lot longer between replacements. May not fit all varieties of hot tubs, particularly including older models. Plastic attachments may be a little flimsy and could break after repeated use and exposure to chemicals. Not intended for use with pop-up or inflatable spas. Always check the reviews. This can give you a good idea of whether or not the product really works as it claims to, as well as what you can expect in terms of potential troubleshooting. Most filters for sale on Amazon have a good number of reviews to go on. Don’t hesitate to try something from a lesser-known brand name if the reviews look good. Just because you’ve never heard of it before doesn’t necessarily mean there’s any reason to avoid buying it. If something seems too good to be true, it probably is. A great filter might cost more than you may want to pay, but it’s likely to be worth it in the long run. If you see something that looks suspicious, like a high-quality filter for a very low price, you might want to research a little more before jumping into it. Remember that you can save on shipping if you find certain products that are eligible for a free shipping discount. This may certainly vary between products but it's always a great value to keep your eye out for. Soon, you’ll be able to shop for filters online like a pro. You’ll never again have to worry about picking the perfect filter when you choose one from the list above. Get ready to have perfectly crystal clean water in your hot tub right away when you choose one of these great filters and see for yourself what makes them stand out as the best filter cartridge replacements on the market today. Hot tub spa filters can be a little bit confusing, especially if you’ve never owned a pool or spa before. Or perhaps you're still trying to figure out how to pick one? If you’ve ever operated an aquarium, you might know a little bit about how a tub water filter works. However, although the principle is more or less the same, the setup isn’t, so it’s a good idea to be sure you understand exactly what you’re dealing with before you ever purchase your hottub filter. In the following sections of this article, you’ll learn all about how to recognize the different types of filters as well as many different hot tub filter parts. You’ll know what a filter does and why it’s always important to have a filtration system set up in your hot tub. You’ll be able to perform a successful hot tub filter cycle from start to finish, and you may even be able to choose the right kind of filter or hot tub pre filter to suit your needs after you’ve learned about the varieties available, too. By the time you’re through, hot tub filter assembly and installation will hopefully feel like a breeze! The more information you have about this important part of your hot tub, the better off you’ll be, so let’s get started right away. Before you go any further, it’s important to learn just what a hot tub filtration system really is. If you’ve ever seen a fish tank, you probably know how a water filter works. The filter in your hot tub isn’t really any different, but it does work on a much larger scale. These filters are designed to process the water that goes into your hot tub and remove dirt, sediment, debris, and even some unwanted minerals before the water touches your body. To begin with, a hot tub filtration system is designed to filter water in your hot tub. This means that the water used to fill your hot tub is passed through the filtration system before it ever reaches the tub portion of the spa. Most types of tubs must be filled through the filter in order to provide clean and comfortable water from the moment the hot tub is set up. The filtration system is usually installed inside your hot tub, with an access door in the tub portion of the spa through which water can flow easily. In some instances, the filter is installed outside the hot tub, and only the filter media is able to reach the water supply. Regardless of the type of installation your hot tub has, the filter more or less always works the same way. When water is passed through the filter media, the filter catches a variety of different unwanted bacteria and other contaminants that are present in the water. The cleaner the filter, the better it works, so a brand new filter is more likely to catch almost all sediments, minerals, debris, and bacteria you don’t want to reach the tub of your spa. However, the longer your filter media is present in the water, the more build-up it will develop. This is why regular cleaning of your filter media is very important. Unfortunately, sometimes the filter system itself can become damaged and need to be replaced. Regular maintenance of your filtration system can help keep this from happening, and it can also help you cut back on the amount of damage done to the rest of your hot tub throughout its life. Damage to the filter—and sometimes just a dirty filter cartridge or other media—can eventually lead to debris building up in and around your filter, too many bacteria in the water, or another problem that might cause pipelines, jets, and even the pump to wear down or break. The filtration system is arguably the most important part of your hot tub. Read on to learn more about just what it does. Now that you’ve seen all these details about replacing and cleaning filters, you might be wondering, “Can I run my hot tub without a filter at all?” It does seem like a lot of work to maintain a hot tub filter, but rest assured that it’s very well worth it. The filter is an important part of your hot tub that helps it function properly. It also helps keep you and your friends and family safe while soaking. Keep the following tips in mind when considering whether or not you can run your hot tub without a filter installed at all. First and foremost, remember that the hot tub filter does have an important job. It’s there to catch unwanted contaminants from the water that flows into your hot tub, and it may protect you and your family by removing harsh sediments like calcium from the water supply. It can also catch larger items like sticks and leaves that might float around in the hot tub and cause damage or cut skin. The hot tub filter also keeps debris from being sucked into the pump. The more debris that enters the pump, the more likely you are to see damage to the pump and its components. This is a much more expensive problem to fix than simply replacing a filter cartridge. Removing the filter from your hot tub can also cause air to enter the pump. When this happens, the results are much the same as when debris enters the pump. You might end up with a completely broken pump or severely clogged pipes. If you absolutely must run your hot tub with no filters installed, you can do so for a very short amount of time. It’s not recommended to do this for more than one hot tub cycle, which is about 20 minutes long. Take note that some pumps and filters require one cycle to be run without any filter cartridges in place in order to prime them properly. Your instruction manual can give you more details if this is true of your hot tub. As outlined above, the hot tub filtration system has many important functions. Although briefly touched on in the previous section, here the benefits of the filter will be expanded upon briefly but thoroughly. Remember that it is always important to have a filtration system installed in your hot tub, and that operating the hot tub without a filter in place is potentially very damaging. Keep the following tips in mind to help you remember just how important and helpful a hot tub filtration system really is. 1. Hot tub filters help keep bacteria from reaching your skin. 2. Filters can help large pieces of debris from entering your hot tub or your inner workings. Although you might assume you’d notice large items like sticks or leaves floating around in your hot tub water, when it comes time to turn on the jets and let the bubbles start moving through the water, you run the risk of missing items that might be in your water. If you sit in the hot tub with the jets on while something large like a stick is moving around in the water, you might end up getting cut on whatever that item might be. On the other hand, if that item gets sucked into the pipelines behind your filter, the entire hot tub system could easily be damaged. 3. Filters are beneficial for keeping air out of your pipelines. Like debris and large items, air is also an important factor in keeping your hot tub safe. While the air in your tub isn’t necessarily a problem, if it happens to make its way into the pipelines, you could have a big issue on your hands. Air in your pipelines can travel to the pump and cause it to operate incorrectly, which in turn might cause it to overheat or quit functioning altogether. With a filter in place, there’s much less chance that this could happen to your hot tub. 4. Filters make it easier for you to balance the chemical treatments in your water. Although the filter isn’t the only part of this important aspect of hot tub ownership, having a filter in place makes it easy for you to get the right readings on your water testing strips every time you test. It also makes it much simpler to treat the water with bromine, chlorine, or another type of chemicals you choose to add. When you have the filter in place along with a chemical treatment, the chances of unwanted bacteria in your hot tub are slim to none. 5. Many hot tubs simply can’t operate without the filter in place. Many hot tubs simply can’t operate without the filter in place. Because of the importance of keeping air out of your lines and pump, many models of spas are designed to not function without the filter installed. In order for your hot tub to work the way it should, you will need to have a filter ready from day one. Without it, the water won’t be able to cycle through your hot tub properly, and although you might be able to fill the tub, it won’t be much fun to sit in. The main types of hot tub filters are cartridge style filters, sand filters, ceramic filters and diatomaceous earth filters. There are strengths and weaknesses behind each type of filter, so depending on what you’re looking for, you might want to choose one variety over another one to help best meet your needs. Familiarize yourself with each type of filter in order to make the best decision to suit your hot tub. Although most types of hot tub filters work on the same principle, they have different parts, and it’s a good idea to know the difference between what you’ll be working with depending on the type of filter you end up choosing. Some filters have many different parts, while others have only a few pieces that work together to create a functioning filtration system. However, certain types of filters are much more expensive than others, so it’s up to you which one you think is best for your needs. Cartridge filters are very easy to clean and can usually just be rinsed out with a water hose. They are made from durable materials such as polyester that allow for water to pass through while other types of matter are trapped in the filter. The entire filtration system is usually contained within the filter cartridge. This means that water is pre-filtered and then completely filtered through the same cartridge. Cartridge filters are usually cheaper and much easier to maintain than other types of filters. They are the most common, and they are by far the most popular as well. These are usually larger filters that allow for plenty of surface area for water to pass through, which in turn means there’s a greater chance of water being clean when it reaches your hot tub. These filters are usually installed on the side of your hot tub, and water is allowed to flow through them before entering your tub. However, in some instances, they are attached to the outside of your hot tub instead. This type of filter is very good at what it does, and it’s able to capture a lot of bacteria and other contaminants. This type is also much easier to clean than any other type of filter on the market today. Since the cartridge can be easily removed, rinsed or soaked, and replaced as soon as it’s dry, this is a popular type of filter for anyone looking for a quick and simple cleaning process. A cartridge style hot tub filter has many different small parts. Some of these are more notable than others, but all of these parts are very important to the functionality of the filter. Lock ring – This piece is at the top of a cartridge style filter unit. It is used to attach the filter to the rest of the hot tub. This is a small round piece that can be screwed into place in some models. Filter lid – The lid portion of the filter is designed to close as needed to keep water from entering, or open when necessary to allow water to pass through. It is made up of a few different pieces that combine to create this important feature. Air vent valves – There are usually a few air vent valves involved in your cartridge style filter. These are in place in order to keep air from entering the filter, and in turn, from entering the pipelines throughout your hot tub. These are very important and should be checked periodically to ensure they are functioning as they should. Cartridge – The cartridge portion of the filter is the part most people refer to as the filter itself. This is the media cartridge that you will clean and replace on a regular basis. This portion of the filter should slide into place in the entire filtration system. You should always purchase cartridges that are designed for use with your specific filter to be sure they’re the right shape and size. Bypass valves – Like the air vent valves, these are in place for an important reason. They help water pass through the filter cartridge media freely every time you fill your hot tub. Body – This is usually a long, cylindrical piece that holds the filter cartridge media, but the shape and size may differ depending on the type of filter you purchase. Base – The base of the filter either holds the filter in place or attaches to another portion of the hot tub, depending on the model you’re using. It is usually a plastic piece that helps protect the bottom portion of the filter system. O-rings, screws, and hardware – These pieces are important to the functioning of your filter cartridge, but you probably won’t have to worry about replacing them very often, if ever. They are simple hardware pieces that are present in just about any type of filter. In essence, diatomaceous earth filters are a type of cartridge filter. However, they’re not exactly the same. While they are usually set up in much the same way as a traditional polyester cartridge filter, the material used for filtering your water is different. In this type of filter, diatomaceous earth fills the cartridge, and your water passes through this fine powder in order to remove as many bacteria as possible. Diatomaceous earth filters are made from the remains of diatoms that have been fossilized and processed into a fine white powder. This is a very common form of filtration that is almost as popular as the cartridge filter. Some cartridge filters also include this type of filtration powder as part of their setup. 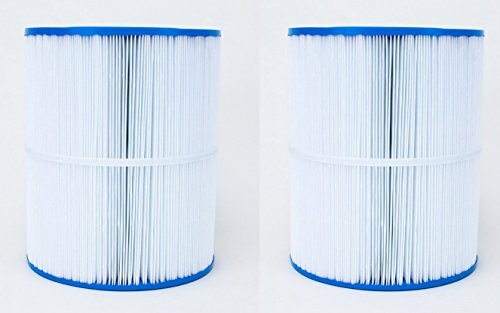 Diatomaceous earth style filters are very similar to cartridge style filters, and many of the parts are the same as well. However, there are a few important differences which make this type of filter stand out. Air release valves – Much like in the cartridge style filter, the air release valves in a diatomaceous earth filter are designed to let air out of the filter before it is pushed into the pipelines. They should be checked periodically to be sure they’re doing their job properly. 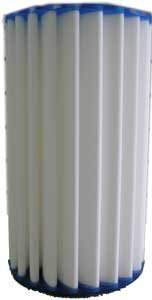 Body – Like in a cartridge style filter, the body of a diatomaceous earth filter is long and cylindrical in most cases. It is hollow and designed to hold the filter media. This makes up the bulk of the filtration system’s size. Media – The media used in a diatomaceous earth filter is very similar to a cartridge, and in some cases, it may even be a cartridge. However, it is usually filled with a different type of material than that of a cartridge filter replacement. This piece slides into place inside the body of the filter. Base – The base is, once again, usually a durable plastic piece that helps support the filter system and hold it in place in or around your hot tub. Throughout history, ceramic has been an important part of filtration systems for many different groups of people. One of the most common and simplest forms of this type of filtration is the clay pot filter. Basically, in a clay pot filter, water is passed through a clay pot which catches much of the sediment and bacteria on its porous surface. The remaining clean water then drips through the surface of the pot into a container ready to receive it. Ceramic hot tub filters work in much the same way, although they’re a little more sophisticated and usually contain an extra level of activated carbon for more filtration protection. Ceramic filters are also similar to cartridge style filters, but once again, they have a few differences. One thing to note is that there are far fewer working pieces involved in a ceramic filter than in a traditional plastic cartridge one. Body – This is the large, cylindrical part of the water filter that holds the filter media. This piece is made of porous ceramic which is intended to sterilize the water before it is finished passing through the filter itself. Filter media – Aside from the ceramic portion of the filter, the inner workings of this type of system also contain a type of filter media, which is usually activated carbon. This is the same type of filter present in a fish tank, and it is a great second level of protection when it comes to using water that passes through a ceramic filter. Mouth – The mouth of a ceramic filter is usually threaded, which means it’s designed to screw into place in your hot tub. This may not always be the case, depending on the type of tub and model of filter you have. However, it should always contain some method of attaching it to the hot tub’s pipelines. This type of filter is growing more and more popular in recent years, particularly with hot tub and pool owners who are looking for a safer, less chemically-enhanced way to filter unwanted materials from their water. Sand filters are usually large, round balls packed with sterile sand. The water is filtered through this sand so that any unwanted particles can be caught through a very natural method. This version of a filtration system doesn’t work as well as other types, and it catches the least amount of dirt. However, it’s very popular with hot tub owners who are looking for an all-natural way to keep their water filtered. These filters must be cleaned very often, and this uses a lot of water. Therefore, this is an expensive type of filter to maintain. Finally, sand filters are set up fairly differently than the other three types of filters listed here. You’ll notice very different parts when working with a sand filter, but they still interact in much the same way. Air valves – You’ve probably learned by now that air valves are an important part of any type of hot tub filtration system. The sand filter is no different. Once again, these valves are in place to let air leave the filter before the water pushes it into the pipes inside your spa. Flange – This is basically an adapter that allows you to be able to install this type of filter on just about any model of hot tub. Some hot tubs still won’t be compatible, but with this adapter, you should be able to use this filter on most varieties. Fill spout – This piece allows you to easily fill the hot tub through the filter without too much struggle. It’s always important to filter your water before it ever reaches your spa’s tub. Pressure gauge – This piece keeps the pressure inside your sand filter from building up too high. It’s vital to the safe operation of this type of filter. Filter basket – This is an important backup level of filtration that helps remove larger pieces of debris from your water as it passes through the full filter system. Backwash adapter – This piece is important in that it helps keep dirty water from flushing back into the filter. You will need this adapter piece if your hot tub isn’t ordinarily designed for use with a sand style filter. More modern hot tubs, however, might not necessarily need it. Hardware pieces – There are many different types of hardware pieces involved in setting up a sand filter. These small nuts, bolts, screws and pegs are important and should be checked about once a year as part of your regular hot tub maintenance. However, you likely won’t find yourself directly involved with them, since your filter will arrive with many of them already in place. Assembling your hot tub filter doesn’t have to be a scary and confusing experience. Although each filter and each hot tub are different, in this section, you’ll be provided with a simple guide to help you get started. This guide can be used to assemble a generic cartridge filter designed for use with most modern day hot tubs. Remember that if this seems too difficult, however, you can always call the helpline for the company that makes your filter. Remove all the pieces from the box. With most hot tub filters straight out of the package, many of the parts should already be put together for you, including several of the small hardware pieces. Most standard cartridge filters will be separated into three parts when you remove them from the box: the base, the body, and the lid. The cartridge is a separate part, and any attachment rings or adapters will also be packaged separately. Turn off the power to your hot tub and drain the tub. You can leave water in the foot bath if necessary while working on this job. Position the base in place in your hot tub. In order to do this, you may need to remove the flapping lid or the grate protecting your filter. This is located inside your hot tub. On some models, you won’t have to remove this piece in order to access the filter housing unit. Remove any existing cartridges that might already be in place. If you haven’t removed the old filter system, now is the time to do so. Attach the base to the correct position inside the filter housing unit. Screw it into place firmly. Attach the body of the cartridge into the base. This usually simply pops into place using an attachment gasket, but it might require a few simple tools in order to complete this step. Slide the filter lid down onto the body of the filter. Once again, this should be able to be completed by hand, but in some instances, you will need to use tools to attach it correctly. Place the new (or used but clean) filter cartridge media inside the body of the filter. This should be as simple as it always is to replace your filter cartridge media when it’s time for a deep cleaning. This step should be familiar to you if you’ve ever maintained a hot tub before. Replace the door or grate to your filter housing unit if you had to remove it. Attach your garden hose to the fill valve in your filter and fill up your hot tub as you normally would. Turn the power back on to the hot tub and let it run a few cycles before you use it or proceed with treating it with chemicals. Your filter system is now in place and ready to use. Understanding how to clean a hot tub filter is a very necessary part of owning a hot tub. If you don’t clean the filter, you’ll have to deal with very dirty, grimy water that won’t be safe to soak in. Over time, as the filter backs up and clogs, the hot tub will most likely stop working altogether. A very badly clogged filter is a sure path to a broken hot tub water pump, which is an expensive problem to fix and can mean the end of your hot tub. By following these simple steps, you’ll be able to enjoy a clean and functioning hot tub at all times. Every two weeks, check your filter. Take a look at it and see how it seems to be holding up. If it doesn’t look yellow or brown, all you’ll really need to do at this point is just use your fingers to pick out any large items like sticks and leaves that might have gotten trapped in the filter media. Every month, rinse your filter. If you have a cartridge filter, which is the most common version of hot tub filtration, all you’ll need to do is rinse it out with a garden hose. Use a strong setting on your hose so you can get some good water pressure, and just focus it on the filter media. This will remove any hair and other larger items that might have gotten caught here. Every three months, do a deep cleaning. Remove the hot tub filter media and place it in a large bucket filled with enough water to completely cover the filter. Add 8 ounces of any filter cleaning solution to the water. Most home improvement stores will carry various brands of this solution, but you can also use the specific type recommended in your hot tub’s instruction manual. If your filter is extremely dirty, you might want to double the amount of solution you add to the water. Let the filter soak for 24 hours, then remove it and rinse it again with your garden hose to completely remove any soap or solution still clinging to it. Let the filter dry completely before you put it back into the hot tub. If possible, let it dry in the sun for a faster drying time. Remember to never put your filter cartridge in the dishwasher or washing machine. Don’t use a power washer to clean the cartridge, and don’t soak it in dish or laundry detergent. Only use the garden hose and a bucket of water to clean the cartridge, and only use filter cleaning solution made for hot tubs. One of the major causes of hot tub filter issues is forgetting to replace the filter at the right time. It’s important to know how often to change hot tub filter cartridges as well as how frequently the whole filter might need to be replaced. When you stay up to date on making these changes, your hot tub and its filter will last much longer, and you’ll enjoy a better quality of water with every soak, too. How long do hot tub filters last? Depending on you filter brand, it might last anywhere from two to five years. However, most tend to run out after two to three years. Your filter’s instruction manual should give you more specifics, but if not, assume you should change filters in about two years. If you use your hot tub more frequently, such as several times a week, your filter’s lifespan may not be quite as long. Regular use of the hot tub may make the filter wear out in about half the usual amount of time. This is normal, but remember to check your filter more frequently if you use your hot tub often. If you have very hard water, you might also need to change your hot tub filter more often. Hard water can build up calcium deposits in your filter, and although you won’t notice this in the water itself, it can be very damaging to the filter. Replace filters earlier than every two years if you notice the filter turning brown or green, or if it starts to come apart during regular cleaning. Every now and then, the filter cartridge might break from extended use. It will need to be replaced when this happens as well. It’s important to know how to change hot tub filter components when the time comes, as well as how frequently to take care of this important maintenance step. Remember that each hot tub is different, and the best way to find out how to remove hot tub filter pieces and change the filter in your specific model is to refer to your instruction manual. However, this may not always be a viable solution, especially if you’ve had your hot tub for a while and have misplaced the instruction manual. Follow the steps below to change just about any hot tub filter when the time comes. Hot tub filters should be changed every two years in most cases. This time may be longer if you have a heavy-duty filter or shorter if you use your hot tub frequently or forget to cover it very often. Check it once a year to be sure it looks as clean as possible, but remember that you might not need to replace it this often. Many hot tub owners alternate filters so one can soak and dry completely without any downtime between hot tub uses. If you do this, it’s a good idea to keep a note somewhere that you won’t lose it to help you remember how many times you’ve used each filter. The first step toward changing your hot tub filter is finding it. Turn off the hot tub and, if possible, turn off the breaker to the power supply. Drain the hot tub completely of water before you start looking for the filter. The filter piece will look like a small bucket or another holder that should be visible without removing any of the other components or pieces. Your instruction manual can tell you exactly where to look, but it shouldn’t be hard to find. Your filter cartridge may be as easy to remove as a simple twist. However, some cartridges are screwed in, so you might need a screwdriver to remove it. You should be able to tell just by looking whether or not you can remove your cartridge by hand. Whichever way you need to remove it, take it out to complete the next step. Using the same process by which you removed the old filter, put the new filter into the container in your hot tub. Read the directions on the new filter to be sure you don’t need to soak it or rinse it first to prime it for use or to remove any unwanted pieces of filter media material. When the filter has been completely installed, return power to the hot tub and replace the water you drained away. Turn the hot tub on and let it run to cycle the filter for at least 4 hours. What Happens When My Filter Isn’t Working? It’s inevitable that at some point during the course of your hot tub ownership, you’re going to run into some kind of trouble. Whether you find your hot tub not filtering, discover that the water isn’t getting hot enough, or even notice that the jets aren’t working properly, the filter is always a good place to start troubleshooting. The following tips will help you figure out whether or not the problem with your hot tub is really focused on your filter or not. If the filter isn’t working, your water flow may be limited. This is usually because something very large is blocking the filter and keeping water from entering the hot tub properly. Clean the filter well or replace the cartridge to remedy this problem. If your water isn’t getting hot enough, this could still have to do with your filter. There are a lot of other problems that could cause the water not to heat properly in your hot tub, but the filter is one of them. Keep it clean and replaced as necessary to be sure water is moving the right way through the hot tub. You might find that your water doesn’t seem to be filtered at all when it reaches your hot tub. It may have a lot of debris in it, or it might be too hard on your skin while you’re soaking. If this is the case, your filter isn’t working right and should be replaced. In most instances, this just means replacing the filter cartridge. Rarely, the entire filter basket might need to be replaced. You can order this replacement part from the store where you purchased your hot tub, or directly from the hot tub manufacturer. One of the biggest problems you can run into with your hot tub is the filter not working at all. This usually means the pump is shot. This may mean that you need to carefully remove all the air from the pump before you use it, or that there’s debris caught in the pump lines. It may also mean the jets and other components of your hot tub need to be cleaned to remove blockages. In a worst case scenario, parts of the pump may be broken and might need to be replaced. Hot tub owners must deal with a variety of different problems that might come up during the life of the hot tub. Below are just a few of the issues you might discover while learning how to better maintain your hot tub. Poor heating. Heating your water is a very important part of having a hot tub. Without hot water, you only have a cold bath on your hands. In some cases, water in a hot tub takes much longer than it should in order to heat up properly. It might only get lukewarm at best, or it might take fifteen or more minutes to really get hot enough to enjoy. In other cases, the water might not heat up at all, leaving it completely cold no matter how long you let it try to heat. In both of these instances, the thermostat is the most likely culprit. The filter or the insulation in the hot tub may also be to blame. Low water quality. Unfortunately, depending on where you live, you can’t do a lot about your water quality. However, you can work to add the right chemicals and treatments to your hot tub water to make it work correctly. Cracked covers and frames. When left out in the elements, your hot tub’s cover and frame will slowly weaken and become more prone to cracks. If this happens, the hot tub may not function properly, and it may stop working altogether. It’s in your best interest to be sure you cover your hot tub when you aren’t using it. Broken pumps. A broken pump will mean that your hot tub isn’t going to work at all. You need the pump to function in order to draw water into the hot tub. If it stops working, it will be expensive and difficult to replace. Unless you notice obvious signs that a pump is broken, like smoke coming from the pump, try all your other repair options first. Of course, some of the biggest problems that have to do with hot tubs revolve around the filter. In the remainder of this article, many of the most common questions about hot tub filters will be addressed, and you will be provided tips and tricks for troubleshooting common filter troubles. There is a lot to learn about working with a hot tub filter. If you’re a new hot tub owner, you might feel a little overwhelmed, but remember that most everything you need to know about your filter boils down to keeping it clean and replacing it every two years or so, or as necessary. Doing so can increase the lifespan of your hot tub and make all of the working parts involved in it functioning as well as possible for a long time to come. CONGRATULATIONS! You’ve come a long way since the beginning of this article. Now all that’s left to do is choose the right type of filtration system to suit your needs, and get out there and install it in your hot tub today. You’ll be able to soak in comfortable, clean, treated and filtered water in no time, and your hot tub will thank you for it.